Lets get on with some chocolate goodies for Valentine’s day, shall we. 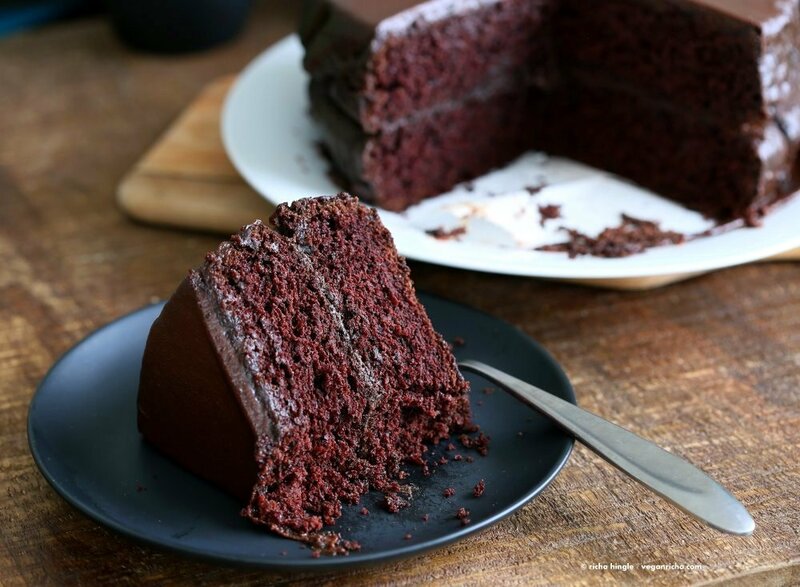 And Make this gorgeous vegan chocolate layer cake! I made this for our anniversary weekend and it worked like a charm to bring a huge smile on hubbs face with each bite. The cake is Moist, not too sweet and just the right amount of decadent for us. 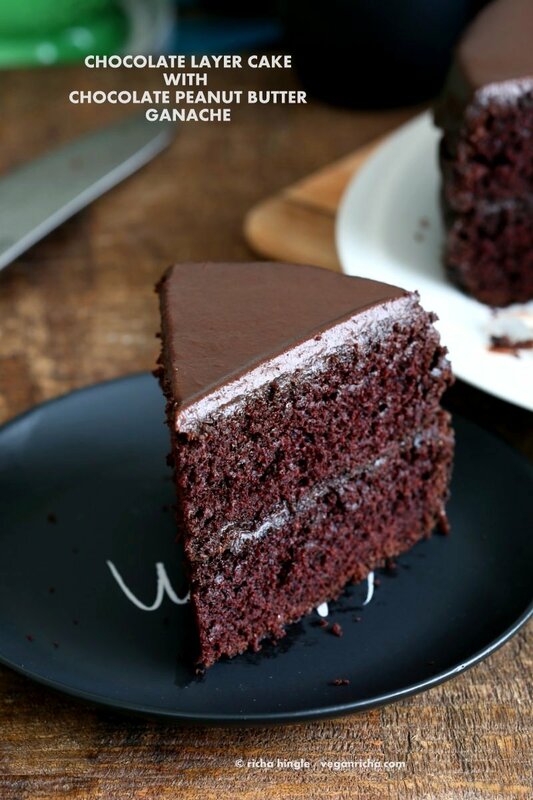 This easy Vegan Chocolate Cake is layered with a smooth chocolate nut butter ganache glaze. I use smooth almond butter. Any smooth nut or seed butter should work. The cake ages really well and tastes best the next day as the ganache adds more moisture to it. Add fruit preserves like raspberry, apricot, blackberries between the layers. I use raw unrefined sugar in this cake, that I blend to powder in my blender before use. Use any fine or powdered sugar of choice. This makes a big 8 inch layer cake. Don’t want the huge cake? make this individual Chocolate Layer Cake for One. No Bake. Peanut or almond Butter, Chocolate Marble Cake. 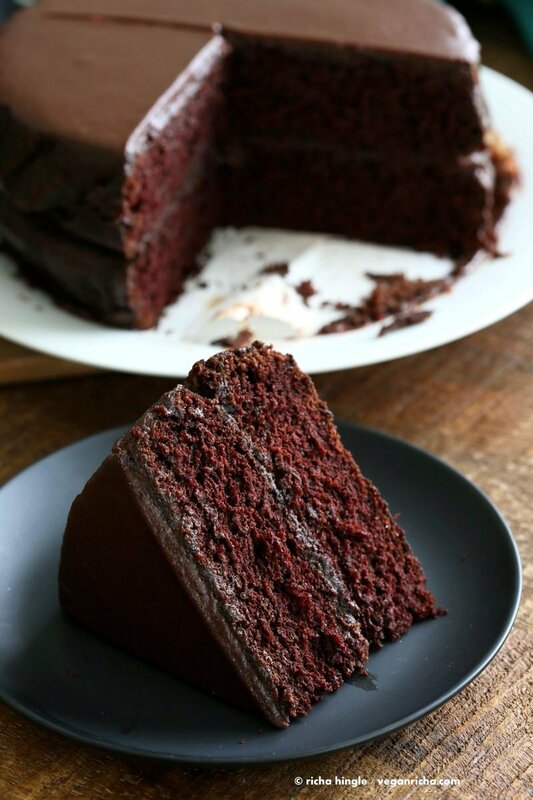 Vegan Chocolate Layer Cake for One. No Bake. Made on stove top. Some No Bake Chocolate Pies here. These sharp and beautiful slices are by my new Kramer knife that hubbs got for me. He knows what will be appreciated! And while you are here, please do read this National Geographic article about how the Tiger Temple in Thailand, one of the premier attractions which claims monks live in harmony with the tigers, is connected to Wildlife parts trade, drugging and abusing of these magnificent wild beings. Updates about the temple can be followed on this facebook page. For a nut-free ganache, you can also use more chocolate (add a 1/4 cup more when you add the 2/3 cup) and melt it in. Chill to thicken in the fridge or the freezer and use. 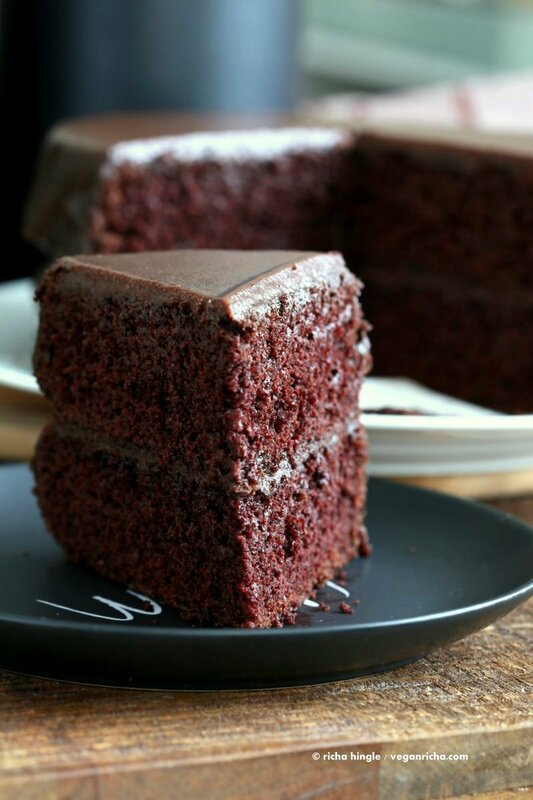 Chocolate cakes can tend to dry out or get hard edges if baked too long. If your cake tends to do that, reduce the baking time by 5 mins. Ovens heat differently, the pans, cocoa/chocolate brand etc add to the iffy behavior. A ganache or glaze will help add moisture to the cake. Let the cake chill with the ganache for a few hours for best results of overall moisture. Use good quality chocolate. It adds amazing flavor and texture. yes you can. it will add a bit of coconut flavor, like coconut caramel chocolate. Can I use more regular flour in place of the wheat flour? Recipe says it serves 4? I wanted to make it for at least 12 people, would I need to increase the ingredients for that? It should serve 6 to 8, depending on the size of the slices. Make 2 cakes. You want to make one to see how it turns out and then make another one, so just repeat the recipe. Thank you 🙂 will let you know how it came out. Made this recipe all in one cake tin and it was delicious – great hit with all the staff! separately it should work out fine. Pack the cake in wrap or ziplock and then in a hard container so it doesnt get squished. The cake would depend on various conditions, ingredients, baking powder, oven etc. I should probably add the non dairy milks that work best for the ganache. I like coconut milk, soy milk and almond milk best. i havent tried rice milk. Yes, the cake keeps refrigerated well for 4 days, else finish it within the day on the counter. Made this tonight for my son’s birthday- huge hit! He isn’t vegan but he is lactose intolerant. Everyone said it was delicious. The recipe says it serves 4! Probably the nut butter, choolate or non dairy milk. If it is still thick glaze, use as glaze. or you can heat it up a bit, melt in some more chocolate chips and add some vegan butter. Do you think i could bake it in one pan instead of two, and then just cut it in half? Do you think i can bake it one pan instead of two, and then justo cut it un half? you can. Use a tall pan. And bake 10 to 15 minutes longer. I baked the cake, but halved the recipe so just in case I didn’t like it I wouldn’t be stuck with a big old cake. The frosting was good, and even though I used the best quality organic ingredients, I didn’t like the cake. What in particular did you not like or would like to improve. Moistness, more chocolatey?, more fudgy ? I made this last night & it turned out pretty awesome! I think I may have overbaked it though cuz it was a little dry. Any suggestions on what I can add to ensure it’s moister? Even my non vegan mom & step dad thought it was great & my mom is going to share it with the people who rent from her. The ganache is what makes this cake awesome! Do you have any recommendations on how to adjust this recipe or if it is possible without changing the texture? Happy Birthday in advance. You sure can make this into a mocha cake. Add 2 tsp instant coffee into the wet and reduce the cocoa powder to 1/3 or 1/4 cup to keep it less intensely chocolate. In the frosting, mix in a 1/2 cup coconut cream and 1 tsp instant coffee. Chill before using. Hi, I made this cake and it was nice, taste wise, but texture wise, it was very dense! what to do to make it light and fluffy ? Hmm, i am not sure. This cake should not be very dense. It should be airy enough with a moist chocolatey denseness but not a heavy dense cake. Maybe the baking soda was old? Try with new baking soda and use a bit more. no, my baking soda was new. it rose well, just very dense. What flours did you use? You can make the yellow cake which is very light and use 1/4 cup cocoa powder + 1 cup of flour instead of 1 1/4 cup of flour in the recipe. Just made this cake for my wife’s birthday. We had a few hiccups with the recipe, but overall it tasted great. Even after all that it tasted pretty good. Maybe a little dry, but not too bad. Thanks for the recipe. We will be trying this again soon once we get a few things. hmm not sure what happened. You can use a whisk to mix in the dry ingredients into the wet. Sometimes the spatula or bowl style causes lumping. The cake dried out on over baking. Depending on your pan and oven temp, bake a few minutes less. a thick ganache also adds moisture back intot he cake even if baked a bit more. Hope the next try comes out fabulous! Serve the urrent one with some ice cream and melted chocolate for added moisture. Looks delish and I plan on making this for my boyfriend’s birthday but I’m curious if you have the macros for this posted anywhere?!? That would be very helpful! I do not intend to make the cake vegan. Just looking for a recipe without eggs. Can I use regular low fat milk, choco -chips in this recipe? I cannot recommend using dairy in any of my recipes as his blog and I are vegan for ethical reasons. Many cows and baby calfs are killed worldwide for dairy. India is the largest exporter or beef and veal(baby cow meat) in all of the World, because of the Dairy industry. 2.4 Million Tonnes of beef and veal are exported each year, almost all of which comes from spent dairy female cows and baby male calfs who are useless for the dairy industry. 38500000 cows are slaughtered every year in India, that is 105900 per day, 4390 per hour. The alternate non dairy milks and yogurts, chocolate taste equally good and are beneficial for people, health, environment, as well as the planet. Environmental effects of the dairy industry include huge amounts of water needed for maintaining the cows(they drink lots of water and eat lots of plants that are water intense to grow), flushing and cleaning, pollution by methane and manure produced by cows and much more. Farming for alternate plant products that would produce plant based milks in comparison needs just a fraction of water. These numbers are indeed horrifying. Thank you for sharing this valuable information. It has really made me think about the choices we ought to make as a responsible citizen of this planet. This recipe will definitely be followed exactly as it is. Will keep you posted on how it turned out:)Thank you for sharing these amazing recipes!!? Thank you for reading Swati. Those are incredibly huge numbers. There are many alternate options that are available these days with increasing demand. Same flavor and texture. Let me know how the cake turned out! I made the cake yesterday and it was perfect with a caramel frosting. However, I have a question. What is the role of the maple syrup in the cake? Do you think I can go without it? I would like to try this GF. Your GF banana muffins have flour mix (almond + oats + coconut) of just over 1 cup. However this recipe uses 2 cups of flour. Could you please advise on exactly how much of the GF mix should I be using. Thanks a lot Richa. Much appreciated. Can I use regular granulated sugar instead of powdered? What’s the conversion? You can use any sugar and same amount. If it is not fine sugar, put it in a blender and blend to make a fine close to powder sugar and use. The sugar is getting mixed int he dry in this recipe, which means it doesnt have enough time to disoolve like it would dissolve when used in wet ingredients. So you need finer sugar else the granulated sugar will have pieces in the cake. Can brown sugar and almond milk be used as substitutions? Made this cake today without Ganache. Loved it! It came out to be perfect! Thanks for sharing recipe. What is the exact amount of the chocolate bar for the cake? How many oz? very good and easy to make, although the amount of sugar could easily be reduced. Wayyyyy too sweet! apart from that, homemade hazelnut butter works like a charm! gives a Nutella-like taste to it. Thanks for the recipe! We made the cake today and it ended up flat and dry we couldn’t even fill two cake forms with the butter. It didn’t look like the picture at all. I am sorry it didnt turn out. What flour did you use? Did you change anything in the recipe? Maybe the baking powder was old. This cake has been made several times (see comments) and I also see beautiful versions of it on social media. I can troubleshoot if you add some info on the ingredients, also how was the batter before baking. Thank you so much for sharing this recipe! Just made it and it’s a winner! A cake my whole family can enjoy. The ganache is actually better this version than dairy versions by a country mile. What type of oil do you reccomend? Is the amount of sugar mentioned in the recipe measured before or after powdering it? Also, how much of this recipe would i need for a 9×13 inch cake? superb outcome!!!! Best chocolate cake ever!! Have you tried making this gluten free? Just got your everyday kitchen book. Looks awesome. The lentil walnut burgers were delicious! It might work. Make half a recipe and make into 6 inch cakes. You will need more than 1 cup of GF blend. I just tried this cake, because I simply love chocolate. I substituted peanut butter for hazelnut butter and added few drops of orange aroma to make the ganache a bit more fresh in taste and it worked. Also reduced the sugar amount by 1/4 approximately. 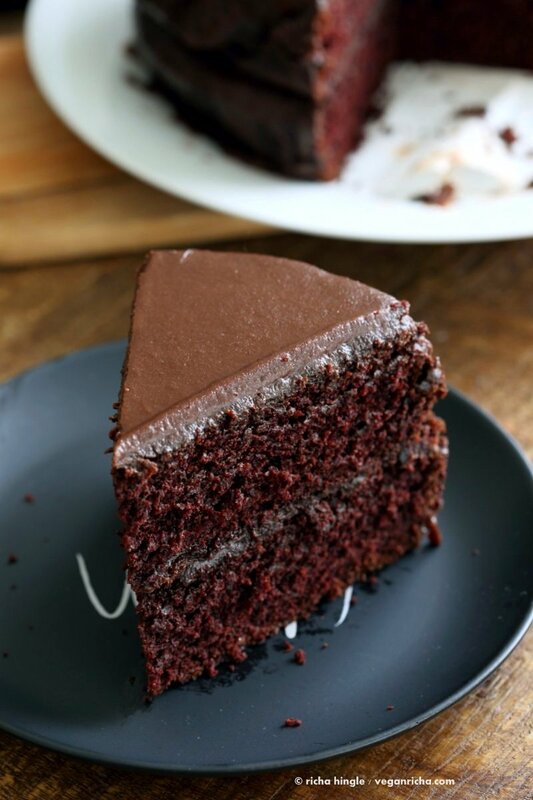 The best chocolate cake you can ever make! Made this into cupcakes a few days ago – followed recipe exactly but baked for 15 min., brushed tops with raspberry preserves, then cooled and topped with ganache (using almond butter), glazed fresh raspberries, and toasted almond slices. They turned out awesome! My very meat-and-potatoes coworkers loved them, couldn’t believe they were vegan. So rich and fudgy. Will definitely make again. Thank you! Amazing recipe! I was not too happy with taste of the cake batter, but it was great once it was out of the oven. And the ganache…it took a lot of willpower not to finish it before I put it on the cake! 🙂 I made two layers and put a homemade raspberry compote in between, and let the ganache chill on the cake overnight. I made this cake for my partner, who is vegan, and for a few non-vegans, and everybody was shocked that it was actually vegan! I’m not vegan myself but after trying your recipes (and doing some research) I think I want to make the switch. Thanks a lot Richa!